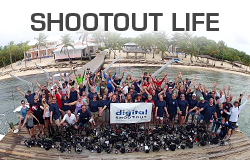 The Digital Shootout, in its 11th year, is the world's greatest underwater imaging learning event. 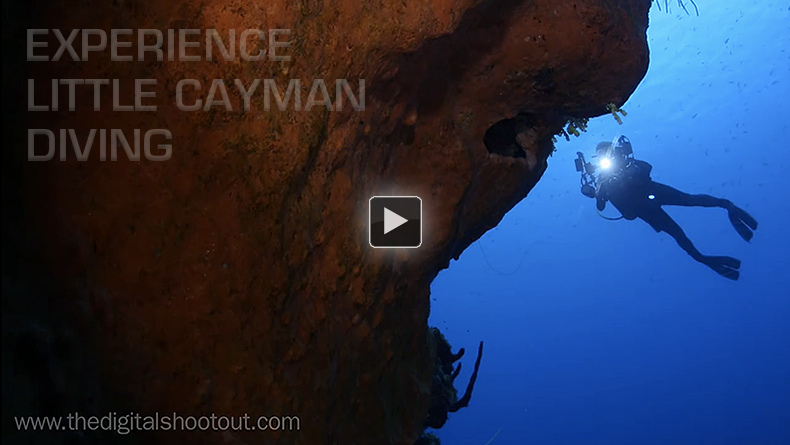 It's also the ultimate working vacation for the underwater photographer. This year's Shootout was held in Little Cayman at the Little Cayman Beach Resort, where our group of 80 was spoiled by the luxurious accommodations, mouth-watering meals (I think most of us went home a few pounds heavier after indulging in the delicious savories and sweets), spectacular diving in the Bloody Bay and Jackson Bight Marine Parks and staff that instantly knew your name and always wore a smile. While the week's schedule is high-octane filled with diving, seminars and slideshows, rest and refueling with a favorite libation was frequently happening at the poolside bar where participants gathered to exchange thoughts and ideas about the day. Learning and competition go hand in hand… well, at The Digital Shootout they do! 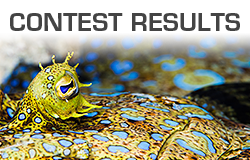 After a week of diving and learning to improve your image taking and image making, there is a friendly, optional contest where the best photos and video captured during the week are awarded some mighty fine prizes. Everyone deserves to be congratulated for a job well done! It's a huge accomplishment to take your diving and shooting to the next level in a week's time, which is what the Shootout is all about. Sitting in a classroom while on vacation in a tropical paradise isn't the expected scenario for most, but for the 60 participants of this year's Digital Shootout, it was nearly standing room only in the packed classroom. Berkley White, renowned underwater photographer and owner of Backscatter Underwater Video & Photo in Monterey CA, shared his photo and video techniques and tips. Being whisked along the learning curve and getting better images day by day, the attendees also gained a greater understanding of organizing and post processing their photos by using Lightroom and Photoshop - some even arrived on Little Cayman a few days before the official start of the event to participate in focused, small-group, Lightroom workshops taught by Erin Quigley of Go Ask Erin fame. 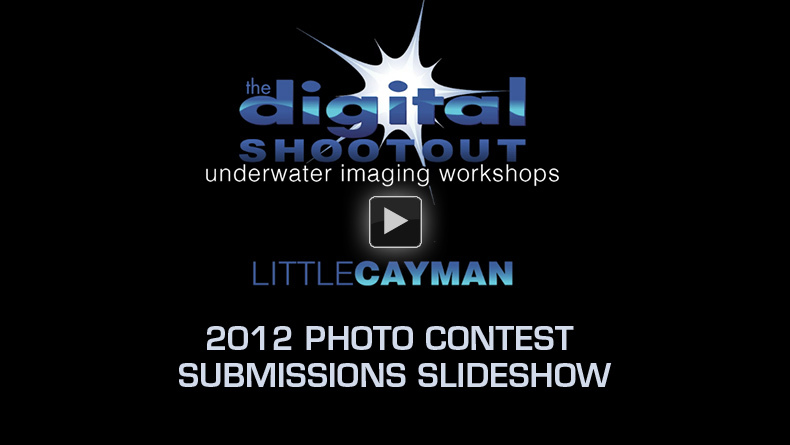 This year's Digital Shootout was spectacular for underwater video! We had an amazing array of digital imaging devices used for underwater video and still images this year--everything from HD camcorder video, to gorgeous RED EPIC footage, to the stunning video of the new Canon 5DMIII DSLR, to some amazing GoPro footage shot with great lighting that surprised many of us! Video editors this year were working with video footage, time lapse sequences, and photos to create a truly diverse range of video and multimedia productions shown at the nightly gatherings and entered into the final video competition. For video editing systems, the adage this year was, "The best editing system is the one you use!" Video editors used a total of five different video editing programs on both Mac and PC laptops. I was particularly excited to use Final Cut Pro X for a brief live editing demo to show just how quickly and easily that program allows assembly of short music videos using the skimming range select function and "append to Storyline" command. Given the gorgeous quality of underwater imaging this year and the wonderful video productions Shootout participants created with so many different systems over the course of the week, I can't wait to see where underwater imaging and video editing will go at next year's Digital Shootout! We had a record number of videos entered into the week-ending, friendly competition! Enjoy the scenic underwater views from our participants! 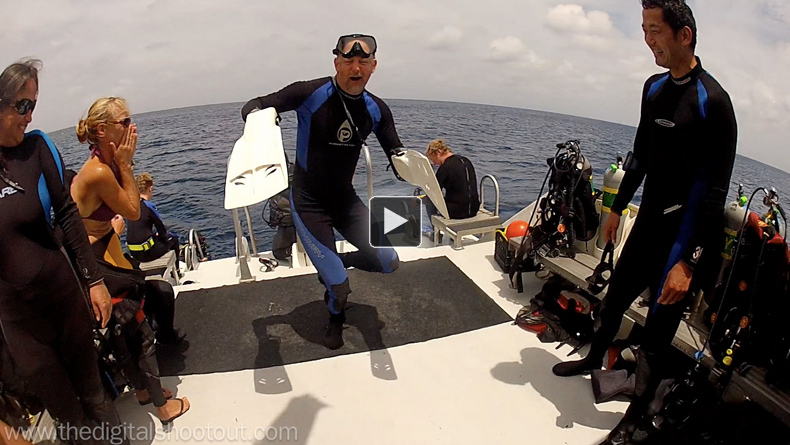 This year, it was our pleasure to have Dr. Roger Hanlon from the Marine Biological Laboratory in Massachusetts join us for a week of diving and camouflage research of marine animals. During each nightly slideshow, Dr. Hanlon gave the group an additional assignment to photograph camouflaged marine animals in their natural environment displaying either uniform, mottled or disruptive patterns of camouflage. Many budding marine biologists were up for the challenge, searching for file fish, squid and octopus to photograph all week to assist the Professor with his research. For more information about Dr. Roger Hanlon, please visit his Web site. Another special guest this year was Katy Danca Galli, photo editor from Scuba Diving Magazine. Katy's assignment: attend The Digital Shootout and blog about it (who wouldn't want that job?)! Read about Katy's week at The Shootout. For anyone even remotely interested in obtaining an underwater camera system, The Digital Shootout is for you. Over a ton (literally!) 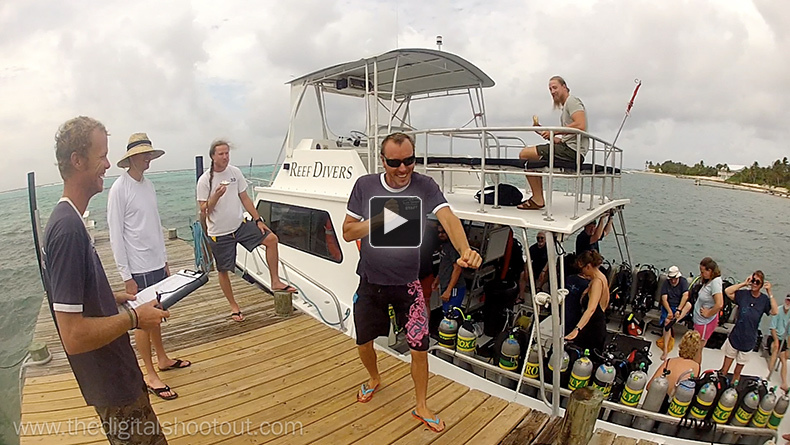 of demo gear was packed and shipped to Little Cayman specifically for this event. Itching to get your hands on the latest housings? Want more strobe power for those wide angle scenics? Wondering why a focus light would help your macro photography? Curious about a 45 degree viewfinder? 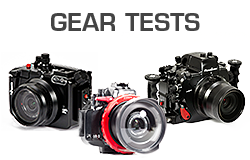 All of these types of gear, and much much more can be test driven at The Shootout. The Backscatter Boys - Jim, Sterling and Russ - worked continually to get the demo gear turned over for the next pair of hands anxiously awaiting their turn to take it for a plunge. In addition, Jean Bruneau from Aquatica and Chris Parsons from Nauticam brought their own systems and accessories for the group to demo, making the demo gear room the busiest area of the resort. Marissa Wiganowske from Pegasus Thruster also brought along four tank-mounted scooters for guests to try. Zipping along the wall and reef was in high demand all week, especially for video shooters who could effortlessly pan a scene with a steady hand aided by the Thruster. And let's not forget Ed Meyers from Canon. Ed was kind enough to haul the latest high resolution 1080p projector for our nightly slideshows, Canon's professional photo ink jet printer that constantly churned out our images from the week and adorned the classroom walls, plus camera bodies and lenses galore! Demo-ing at The Shootout is like a kid in a candy store! View more of the "Shootout Life" in the below videos and photo gallery. Berkley White and Dan Baldocchi are the owners of Under Exposures, the dive travel company that organizes The Digital Shootout. Year after year, they enthusiastically orchestrate this event, bringing together the finest group of professionals to provide the utmost in training and services to underwater image makers wanting to fast-track their skills. Thanks guys for your vision… we are honored to be a part of it!